“I AM A TEACHER” is not just any line we speak, the moment we speak this line we really mean something which has an emanace pride, joy and full of responsibility. 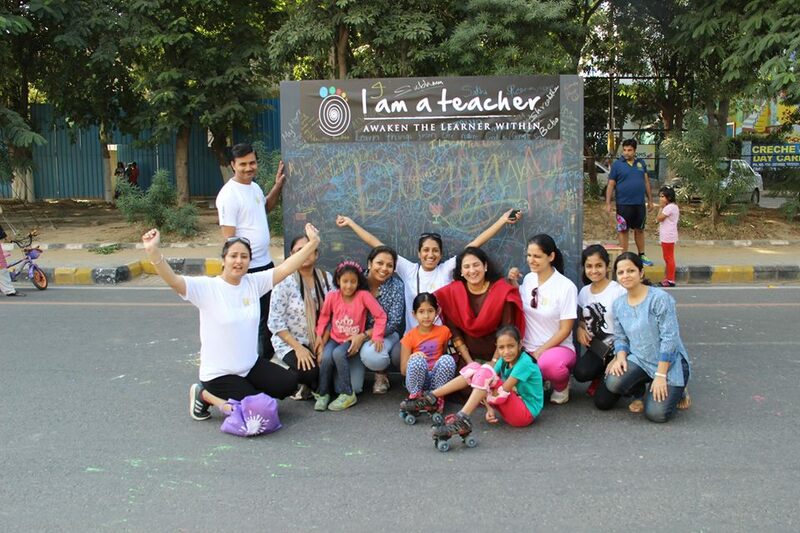 IAAT is a place which offers a life changing experience and makes you realize what it means to be a teacher. This program will help you to realize its true meaning, to find that joy, pride and huge responsibility in teacher’s role. Once you are done, you are never going to be the same person that you used to be. For this experience, actually you need not to complete the program, you can feel it in between. After spending two weeks at IAAT and seeing the program details and functioning, I would say if the MA Education program which is of two year of azim premji university is compressed into one year then it will become very similar to this program. All the foundational courses are same except mindful personal leadership subject. I also experienced that not only the program course, in terms of culture and diversity, classroom environment and faculty’s nature is also very similar to my university. I want to congratulate the leader of the institute for this innovative initiative which effectively working and delivering what they have promised. The leadership and management team is doing great job. The whole setup seems to be working under collegial model of leadership ensuring everyone’s participation through shared values to achieve the shared vision that institute have. I also get the sense that this program is working towards the development of instructional leadership targeting students through teachers and hence investing huge effort on the core activities of the organization. The self reflection practice, conferencing-mentoring program and beautifully blended intensive theory-practice which is demonstrative in nature are ensuring the professional development of student teacher which is again a key feature of instructional leadership. This is what we really need right now to address the challenges of our school. Among the courses that are offered, I liked the most is course “mindful personal leadership” which focuses on exploring of self and then slowly moves to leadership quality that a teacher should have, afterall teacher is first leader in a classroom. It is also important because these things are very essential for every person to know and in case of teacher it becomes necessity. As a teacher, consciously and unconsciously we do many things which student often try to follow and get influence easily, inside and outside the classroom. Then as a teacher it becomes extremely important that we should be very mindful about our own thoughts, action, behavior, gesture and even words that we chose to speak and it is not possible until we know ourselves properly. We should enquire ourself deeply and necessarily know what is all which is constituting ourselves. Then only we can be mindful and able to make conscious choices as teacher. These things should be addressed in every teacher program but only a handful program pay serious attention, rest even not bother to think about it. This program also offers all subject pedagogy under method course which again doesn’t happen everywhere. This gives a wider opportunity to the scholar to go for any subject teaching as per their interest . It is good if teacher going to single teacher school where strength is low. Beside this it helps the scholar to understand child in their elementary school that what they are doing in all subject and where they are facing a problem, and as a parent a lot of course. Then program integrated with enriching module activities which is adding value by filling the gaps that might be left from the main courses. The way program course is structured and arranged is remarkable making a good balance between theory and practice. I have seen in some institute that theory and practicum classes are treated very different to each other and practiced alternatively or separately. So, I would say it’s possibly an ideal combination of theory and practice. One of the concern regarding program is about syllabus under these courses. From title of the course I was wondering how much this programming is doing justice with this huge content against this short period. Through conversation I come to know the content selection process which ensures me about this. I was having this concern because all subjects (which I also have in my program) are in very good connection to each other and sometime it’s very hard to understand one without the other. The second thing I came across is time constraints. I think all the student are having this concern and all of you also are well aware of this. This thing is putting little limitation on learning as it is not letting them explore the other thing related to the content. So, if scholar will have leisure time in between the course then possibly they can go on exploring further what they have learned in the classroom, but this flexibility was not visible and it gives me a sense of very packed program. Going further if I have to say then I would suggest that doing independent study is also very essential characteristics of a teacher and it may need mutual discussion among student-faculty together to explore the possibilities of doing this. The other thing that stuck me the most is your mentoring and GRR system of practice. The way it has been structured and monitored is really examplory for all the institution out there in the teacher professional development program. I would suggest every single institute if they can implement this structure without any improvisation. I would also like to mention that this is where we are lacking when we talk about our teacher curriculum implementation. The other pre-service professional development program like B.Ed and D.El.Ed. have this good curriculum and syllabus, well qualified faculty, student-learner, resources but still these program never happens the way it should be. A good leadership and management of program, field practice school, attitude of the regular teacher of field schools and trainee teachers are some crucial factor which I think playing role in ineffective implementation and practice of the program. It has become a formality to have a degree to be eligible for teaching, although exception can be seen everywhere. The collaborating teacher and mentor’s feedback during pre and post conference, guides the resident teacher and add quality value in their understanding of student, classroom and teaching practices. All the faculty are really putting their huge effort into this practice. The concern here I have is that it happens that students take resident teachers for granted sometime, then how this relationship is being nurtured and ensured that everything goes well, is something to be pondered upon. This institute has the advantage of attached school which has enriched resourceful classrooms and well qualified teachers acting as CT but it often turns out to be a challenge for the others institute like B.Ed program institute. All the resident teachers are doing great work in their LTW, at least that I observed. But again it also makes me think if they can perform exactly the same way as here if they are placed in a rural government school or a normal government school in urban which are conventional in nature and has scarcity of resources like a primary school of a village. So, I was wondering, are student-teacher being prepared enough for all kinds of schools or any particular setting. The classroom environment and culture is really great. It reminds me the culture of an African tribe “UBUNTU– I am because we are”. There is no competition among scholars instead there is support, cooperation and encouragement for each other. They appreciate each other for their similarity and difference which they carry and the bonding between peers is really very promising. The other thing which attracts my attention was the program fees and the demography coming here. If I see the fees as a very common (lower economic) student I do not find it favorable although I know it is the lowest possible fees being charged against the experience it delivered. But I think it affects the demography as people are more likely to compare with fees of B.Ed program at government institute and recognized degree at the end of the program. Second, not being government recognized certificate diploma it might filter out a large number of people and bring only a quality and interested people who are looking for something different from conventional and have a learning spirit by letting previous things go. For now the institute is running at small scale and it make difference but will it work at large scale as well exactly the same way. In this regard, sustainability of this practice is a concern. Your partners and participants are adding more value to the program. ‘JODO GYAN’ is making things very simple and one of the key feature of method course which is changing perspectives of the student-teacher. All of them are really big fan of the pedagogy practices and TLMs that they used during the lectures. While interacting I also came to know that they frequently use TLMs made by JODO GYAN. I want to meet the guest faculty and discuss regarding their pedagogy and TLMs they have used here. This kind of work is very limited specially in mathematics subject. Again, It also makes me think that excess dependability on a particular tool material might not be a good thing, so are student-teacher aware of alternatives as well is what I would like to explore more ? Seeing this program as it is, within certain boundary seems to be the best option with no alternatives in a teaching-learning space at least for me. It equips scholar with everything that they need to know and should have as a professional teacher. It is offering one of the good practice that India till date have in Pre-service teacher professional development. I hereby convey my best wishes to each and every member of the program for their upcoming challenges and opportunity. May this institute blossoms day by day and act as major source to fulfill the needs of our education system.